Heather: How does one even begin to discuss her favorite TV show of all time? While other kids grew up and loved Boy Meets World, 3rd Rock, and Fresh Prince, I grew up with The Avengers. And the show has traveled with me to adulthood. Diana Rigg is my spirit animal. So this will be the biggest GEEK-OUT you’ll ever receive from me at a roundtable discussion. What sets The Avengers apart from the other shows we’ve seen thus far is its utter Britishness. Wit and absurdism are mainstays of British entertainment, and they’re both present here. The show fuses old England (manifested by John Steed with his bowler hat, gentlemanly dress, wood-and-leather apartment decor, brandy snifters, Bentley) and the new/mod (manifested by Emma Peel with her leather catsuits, miniskirts, convertible Lotus Elan, martial arts training, modern flat, and feminism). The show offers a true pastiche of the history and future of England. The Avengers is both beloved and ridiculed for its extreme, over-the-top, ridiculous, fantasy-spy genre. 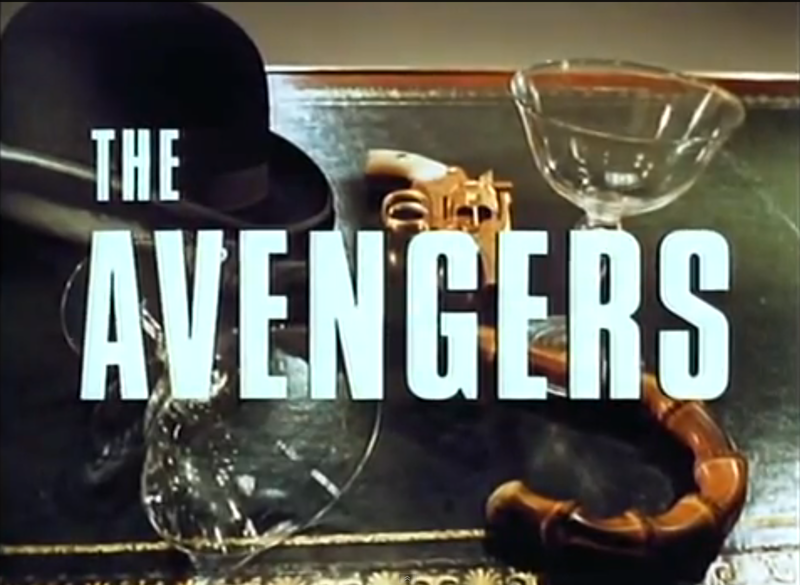 Producer Brian Clemens admitted as such, going so far as to say The Avengers had no social conscience whatsoever. And yet, when viewed through the lens of 2013, this weightless, spy fantasy can actually reveal and speak to such issues as social change, progress, and power. Yes, The Avengers is absurd and fantastical and bizarre. It is also sophisticated and stylish. It is both ridiculous and witty. Campy and hip. The Avengers has swag—mostly because it revels in its outlandish existence. The show is constantly giving its audience a side wink. It’s James Bond meets Hitchhiker’s Guide to the Galaxy. This is not Mission: Impossible with its intense, complex plots and mission-driven narrative. There isn’t the physical, cartoonish humor of Get Smart, nor the international intrigue of I Spy. 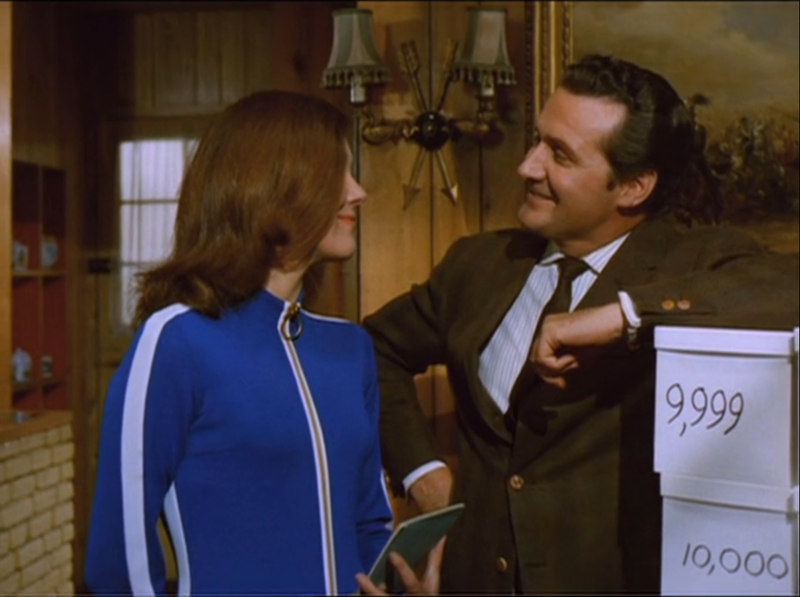 There are no gadgets in The Avengers; there isn’t even a boss to whom Steed and Mrs. Peel report. (Mother isn’t introduced until the final episode of season six.) We know that Steed works for the defense ministry, but that’s it. Where and how he gets his orders are unseen and unspoken. Mrs. Peel isn’t technically an agent; she’s more of a freelancer—with awesome fighting skills and a genius-level intelligence—who becomes Steed’s (unofficial) partner. These details aren’t necessary to the show. The Avengers is about the pair of them, solving outlandish crimes. The particular case in “You Have Just Been Murdered” follows a string of millionaires who are extorted into giving a million pounds to a mysterious individual—if they don’t, they’ll be killed. To make this threat clear, each millionaire is attacked by the same silent, blond assassin and “murdered” through a variety of ways: poison, gun, stabbings, hit-and-run. 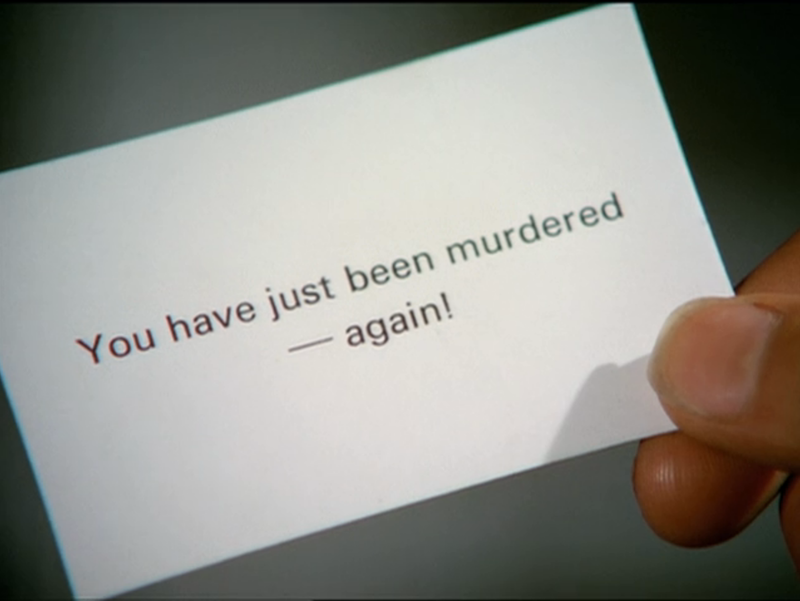 The assassin doesn’t go through with the murder; they’re merely hypothetical and he flicks a plain white card at the intended victim with the words “You have just been murdered.” Steed and Mrs. Peel are called in (by a victim and his banker!) to figure out who is behind the threats and to stop him. It isn’t one of The Avengers’s finest plots, but it’s clever and campy enough to entertain. Patrick MacNee and Diana Rigg play off one another brilliantly; the range of facial expressions from Mrs. Peel is worth its weight in gold. The episode asks the question: How much would you pay to save your own life? It paints most of the millionaires as sniveling cowards who can’t raise a hand to defend themselves. 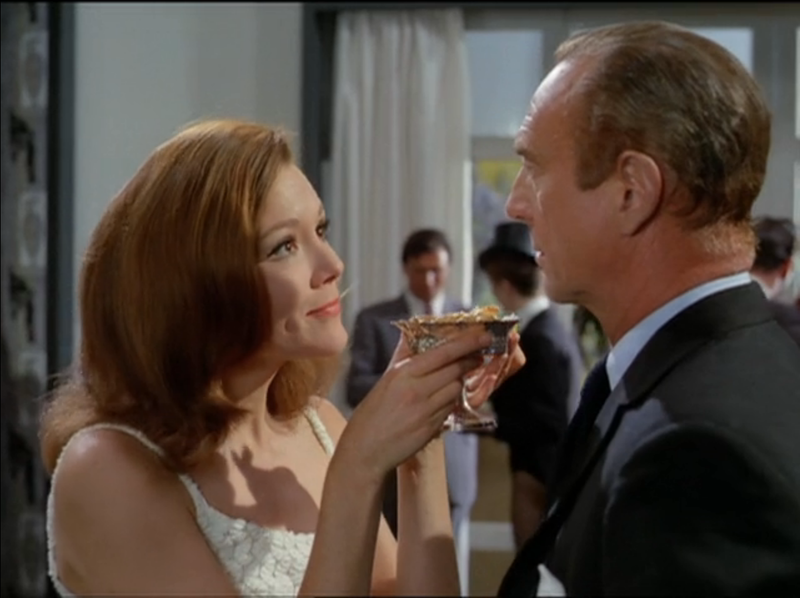 The final millionaire, George Unwin, decides to do something about his situation, yet he fails to clue Steed in and thereby places Mrs. Peel in danger. While the plot is full of holes and laughably unrealistic, I always find the blond assassin Skelton to be chilling. His silence is unnerving, and he just appears in rooms with lethal weapons. That moment where he swivels in the leather chair to face Unwin, who’s writing notes at his desk, utterly unaware… Freaky. Emma Peel is the one to have 90% of the action in this episode. Steed meets with bankers and makes phone calls (bless). Mrs. Peel trespasses onto private property, engages in several fights (one that includes a sickle and one that involves water), and wears a truly astonishing assortment of fashions—from that white feather coat to her space-age leather outfit to her jersey Emmapeeler. She looks so thoroughly annoyed when she’s trapped in Needle’s lair, and you can only imagine that she’s plotting of some way to take all those guys out.) It is no surprise that Emma Peel was a feminist icon in the 60s—and beyond. Les: Heather, it’s interesting that we’re discussing this episode the same week that you published your latest Brit TV column, in which you stated that you came to Bergerac looking for the British equivalent of Remington Steele. Because to my mind, that’s exactly what The Avengers is in so many ways: A show that understands perfectly the tropes of the genre within which it’s operating. A partnership between a stylishly dressed man who always has a clever riposte and a beautiful woman who’s every inch his equal in a tricky situation. And an awareness on everyone’s part of exactly what kind of show they’re making and they can be serious when they want to, but more often than not they simply choose not to. Given that Remington Steele is easily in the top five of all the shows This Was Television has covered since we started doing these roundtables, it’s no surprise that I really enjoyed the similarly themed The Avengers. Before seeing this my only exposure to the series was the godawful Ralph Fiennes/Uma Thurman 1998 film adaptation, and this washed those memories away in a welcome burst of straight-up fun. The plot is, as you say, mostly clever and campy as opposed to the more serious or outright satirical ones that we’ve seen before, but it’s got a great concept behind it and I found myself chortling every time Skelton flipped over one of the “You have just been murdered” cards with all the disinterest of a man handing them out at a business gathering. (This is yet another one of those episodes where it was selected for discussion solely on the basis of the title.) It nicely ratchets up the tension on each of the millionaires as they find their security measures thwarted time and again, until they either finally drop the money or the act finally takes place. I thought the villains in play were appropriately menacing—Simon Oates’ Skelton has already been called out, but George Murcell as the mastermind Mr. Needle has a wonderfully sadistic edge that fits in well with the accentuated reality of the fantasy-spy world, and is chewing scenery with gusto. Also in the context of this roundtable, after four episodes in which our heroes have been operating on the instructions of an entity far larger than they are alone, it’s nice to see a larger bit of agency on the part of the involved parties. Steed and Mrs. Peel don’t need any orders to pursue the lead, all it takes is one invitation from Jarvis to get them on the scent and follow it to where it leads. (Funnily enough, it reminds me a bit of Hart to Hart, where the central couple found themselves caught up in these murderous circumstances but their own curiosity and ingenuity kept them pushing forward.) I found myself more interested in what was going on as a result, because even though our titular avengers may have had less intel than the operatives of U.N.C.L.E. or IMF, as an audience we’re finding out events at the exact same pace they are, which aids to the immersion and sense of fun. And as an aside, I’m so thrilled that at some point in this roundtable, we finally came across a villain whose stated goal is not simply to accomplish a short-term financial or political goal, but that old chestnut: try to take over the world! Between that and the fact that when his car blew up it hurled him into the tree Wile. E Coyote style, it helpfully undercut the fact that this guy is an fiendishly clever serial killer toying with these millionaires like a boy pulling the legs off of spiders. J.: I just want to underline that, because I think it’s worth mentioning again: when Needle’s car exploded, his lifeless corpse—still clutching the steering wheel!—was flung up into a tree. And then Steed and Peel looked at it and giggled. This may be the single greatest thing I’ve seen yet in one of these roundtables. And that’s also the moment that really sums up the show for me. 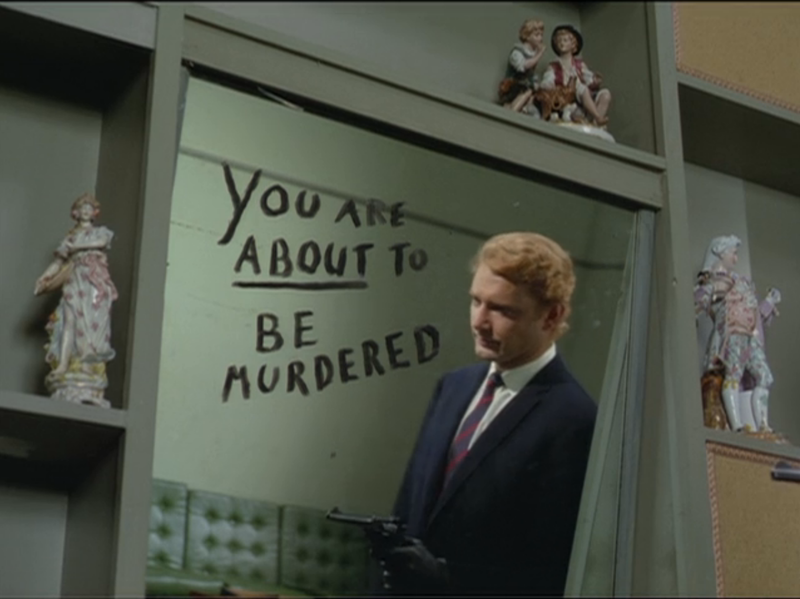 “You Have Just Been Murdered” is an outrageous collision of tones and attitudes—honestly, for the first half or so, I couldn’t tell if I supposed to be taking any of this seriously. But at some point (probably when Skelton pinned Unwin against the wall with his car), I finally clued in to the absurdity of what was happening. Retroactively, everything clicked into place—the ridiculous villain, Peel and Steed’s practically blase response to the murders and blackmail happening around them, even Steed’s pointedly fancy car. In the last half, once we were introduced to Needle TV, I started to get an unmistakable Adam-West-as-Batman vibe. (And I mean that as a compliment.) But where Batman largely got by on its wacky, campy appeal, this was often genuinely funny. (Favorite joke: “Get to the point, Needle!” Followed immediately by the villain’s crazed, nice-try-buddy laughter.) Not to mention the wonderful Emma Peel, who I could watch fight off henchman all day long. 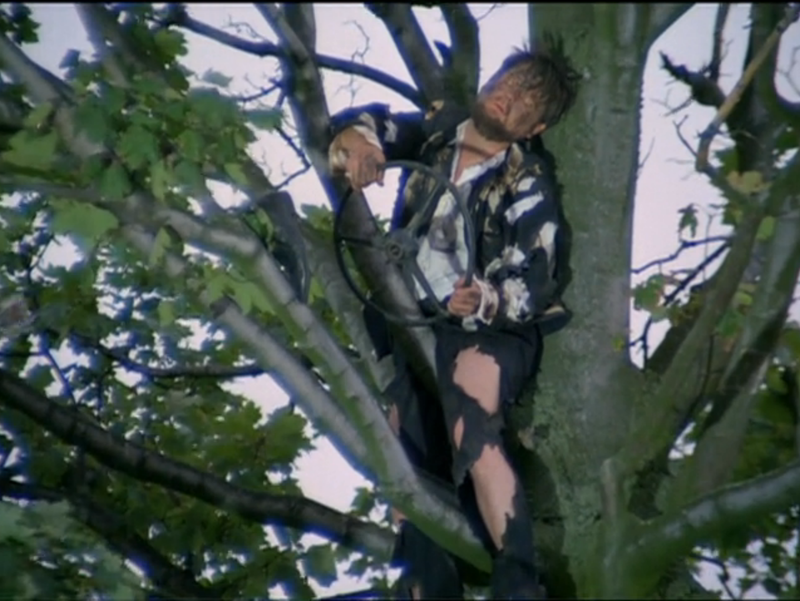 But seriously: the bomb blew him into a tree. How deliriously, delightfully Pythonesque! Cameron: I honestly didn’t know there was a British TV show called The Avengers until about a year ago. Crazy, right? I also didn’t realize it had nothing to do with the Marvel Comics series of the same name. Naturally, that didn’t stop me from having a damn good time watching this episode anyway. The most immediate reaction I had was to Emma Peel, as played by Diana Rigg. I’m always happy when we get actors with compelling performances or well-written female roles, but the combination of Emma Peel and Diana Rigg is beyond captivating. I actually thought she outshone her male counterpart, whose character name (Steed) I didn’t know until she said it, and whose actor I still can’t call up from memory. 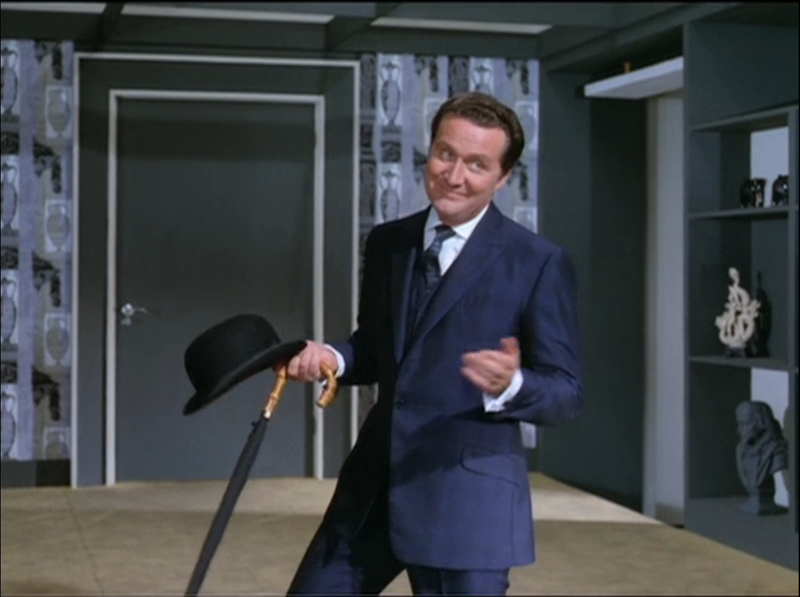 What was especially compelling about how The Avengers was written is that it seemed to give the action sequences to Emma while leaving the talky scenes to Steed. It was a complete reversal of what I was expecting, given some of the other shows we’ve seen in the TWTV Roundtable, particularly in the Opposite-Gender Pairing Detective roundtable we did. (There’s gotta be a better name for that. I’m just not thinking with my brain right now. … I mean… oh shut up.) Emma certainly seems to be the type of character that would inspire young children, so it’s not surprising to hear you speak of her so highly, Heather. She’s quite the presence. And that line of thinking inexorably drew me to, of all things, Xena: Warrior Princess. In contrast to its era counterpart Buffy the Vampire Slayer, which always retained a self-seriousness and gravitas throughout its seven seasons, Xena became a more thoroughly enjoyable show when it leaned into the inherently campy quality of its world. That seems to be the same kind of thing The Avengers is trying to do here: it separates itself from the rest of the pack by leaning into the absurdity of the idea (in this case, fake-murders eventually giving way to real murders with a calling card, “you have just been murdered) without sacrificing the suspension of disbelief. The show is outrageously funny, but stops just shy of putting a silly soundtrack behind every scene (and in fact, the dramatic scoring only served to underscore the humor of the situations even more, which just made the whole experience more pleasant). And the show’s leads are wry and witty, but stop just short of full-blown meta in the vein of Community or Supernatural‘s more overt comedic episodes. It’s classy and elegant, but knowing, elements that are made clear in the first few seconds of the opening sequence, when Emma shoots Steed’s champagne bottle and it explodes, WINK WINK. Another example of a TV series the networks would never air today. Not only is it genuinely witty, but everybody in it is British! Hell, half the leading men on television today are furriners, and the networks make them all talk Amurican. Oh…I SO enjoyed reading all the comments. I first was introduced to The Avengers in the 60’s by my Dad (back when we still had a black and white TV). I fell in love with them then – and the love affair has continued since. Les, Cameron and J – please watch other episodes of The Avengers; I agree with Heather that this isn’t the best. (I am surprised that no one commented on Needle in a haystack 🙂 ) Diana Rigg is magnificent in this series – and whether or not there was actually anything between them, the on camera chemistry can’t be denied. I was first introduced to the The Avengers back in the 60’s (Thank you Dad) on a black and white TV. I fell in love with the series then, and the love affair has continued. Les, Cameron and J – please try and watch other episodes; I agree with Heather, this one isn’t their best. I enjoyed reading your comments – and maybe it’s my age – but no one commented on a Needle in a haystack.